Marpha is famous for its apples, and many of them come from the Tibetan settlement. Apple orchards and farming are part of the LWF’s work for the people who fled Tibet in the 1960’s and found a new home in Nepal. Marpha is situated at the Thak Kola river, at 2670 m in a highland region inhabited by the Buddhist Thakali people. The town is famous for apple and apricot products, from dried slices to brandy, and its Tibetan souvenir shops. The Tibetan refugee settlement seems to be a charmingly traditional district of the town. There is a primary school, a health clinic and garden plots for each family. Solar cookers catch our attention in the otherwise very traditional streets. Garlands of prayer flags flutter everywhere: On the suspension bridge leading to the settlement, over houses and streets and around the gumpa, the traditional temple, where old women circle the rows of prayer wheels, mumbling the “om mani peme hum” a famous mantra especially used by followers of the Dalai Lama. Norbu Phuntsok, the camp manager, proudly shows us the work LWF has done here. Due to LWF donations, the river which undercuts the pathway to the settlement every spring has been reigned in with fortifications on the river bank. LWF did vocational training for the youth, helped to make the soil fertile in the orchards and fields and worked in capacity building so the camp could raise its own funds. Like in the other refugee camps, LWF works through community-based organizations and builds their capacities on the way. LWF is the only NGO assisting in the camp. “They have contributed a lot”, Mr. Phuntsok says. 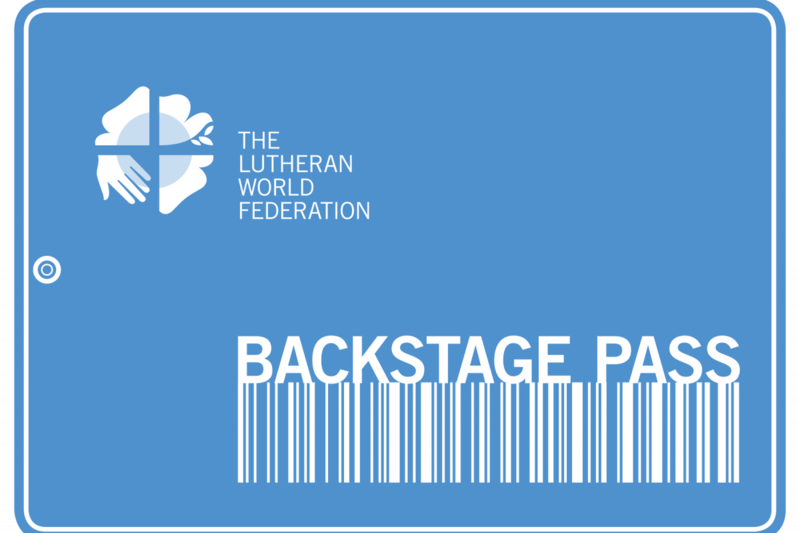 Also, LWF sponsored the new guest house, where some of the LWF Backstage Pass group are staying that night. While it is still very basic, Mr Phuntsok hopes that the guesthouse in the Tibetan settlement will attract trekkers in the future. Because creating sustainable livelihoods is not just about money for community structures. It is vital for the future of the camp. Though Tibetan refugees have well-established structures in organizing their exile, and are supported with donations from all over the world, refugee settlements hold little attraction to the young people of the community. “They want to go abroad, to Europe and the USA”, camp manager Phuntsok says. Education opportunities lead the young people away from the settlement, first to high school in Pokhara, then to graduation in Kathmandu. For university studies, many go to India. There is little temptation to come back to the small town of Marpha with the cold winds blowing upstream in the morning and downstream at night and to do agricultural work. Two years ago, the settlement was connected to a telephone line. “The young girls go to nursing school in India”, the camp manager gives an example. “Two of them have graduated so far, but when we asked them to come back and work in our health clinic, they said they had found jobs with good salaries there, and wanted to stay a little longer”. We visit an elderly woman, who came in 1964. In her kitchen, meat strips hang to dry, and Tibetan tea cups sit on a small table. She demonstrates how she still makes Tibetan butter tea. Her living room is small but beautifully decorated with painted Tibetan furniture and pictures of all 14 Dalai Lamas. Norbu Phuntsok is concerned about people like her – the first generation of refugees who now come to an age where they need assistance. As younger family members move away and the community ages, there will soon be little capacity to care for the elderly. Tashi, the woman we met is lucky: Her daughter Dolma runs a successful souvenir shop in Marpha. Dolma has only two years of school, but her shop supports her parents, her little daughter and herself. Some of the traditional handwoven belts and scarfs are made by her mother. “The local people do not do much handcrafts, so they also buy our products”, Dolma says. It is but one example of a successful interaction with the local community and a small enterprise, which might help the future of the settlement. “Initially, people stayed here because it is close to Tibet and they hoped to return”, Mr. Phuntsok says. “Now, we don’t feel as refugees anymore. This is our home”.